Extreme poverty declining but much work remains, says Vatican rep at U.N.
UNITED NATIONS (CNS) — Despite the good news that the percentage of people living in extreme poverty is set to go below 10 percent for the first time since such data has been collected, much work remains if the United Nations’ goal to wipe it out entirely by 2030 is to be met, according to Filipino Archbishop Bernardito Auza, the Vatican’s permanent observer to the U.N.
“The number of people still living in extreme poverty continues to be unacceptably high. 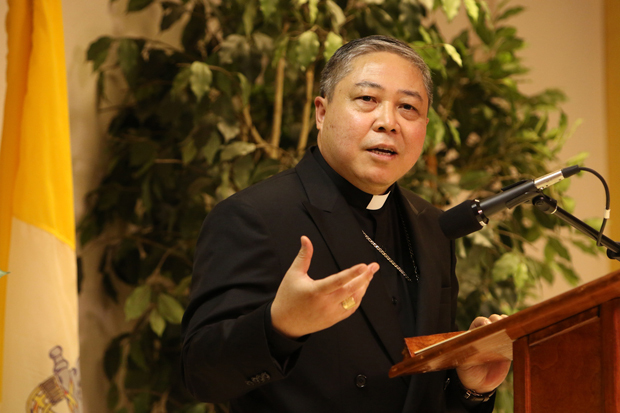 The more than 700 million extremely poor remind us of the magnitude of the challenge still ahead,” Archbishop Auza said in remarks delivered Oct. 13 at a U.N. committee session on poverty eradication and development issues. According to World Bank figures issued Oct. 4, 2.2 billion people worldwide live on less than the equivalent of $2 a day. “That is only a slight decline from 2.59 billion in 1981. It indicates that poverty resistance is stronger, as we progress higher in the economic ladder,” Archbishop Auza said. “This challenge is even more daunting if we consider … the facts that progress has been slower at higher poverty lines, that those remaining in extreme poverty are the most difficult cases, and that, for many of those who have escaped extreme poverty, progress has been temporary and regression back to extreme poverty is even more painful and debilitating,” he added. The U.N.’s 2030 Agenda for Sustainable Development places the eradication of extreme poverty as its top priority, placing it in the context of a global environmental crisis.